Although genealogists love cemeteries they often overlook the funeral home documentation. But this documentation is vital to our research for several reasons: 1) it allows us to look at the social history of the time. 2) it may have family secrets held in it, like private notes of the cause of death that was withheld on the death certificate 3) it may tell you about the customs and traditions of an ethnic group. 4) it may have a listing of family members not yet known. 5) it may help you solve a mystery (i.e. in my case a murder. 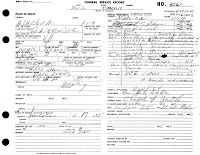 6) it may help you find a copy of a DD214 (military discharge) that was lost in the NARA – St. Louis fire of 1973. Recently I was hired to assist in confirming if a person was murdered. The family believed the murder was due to a generational family feud, but couldn’t prove it. However, it was suspicious that the wife and husband died within a day of each other, both of “heart failure” on their death certificate. After pulling death certificates of the couple, and noticing the informant was the same, I chose to widen the search, for additional hints. Voila everything needed was written in margins.This began my love affair with funeral home documentation. Since funeral homes rarely go out of business, but are acquired, sold or merged with other business, their records are passed on. The seller rarely cleans up his records, but boxes them, and walks away. Making these boxed documents true treasures. In the margins, you can learn what was left off the death records, so that a proper burial could be had. For example, as suicides were not honorable, if on the death record a church burial might be denied. But the information might still be found within the funeral home’s archives. Also, where coroners and funeral homes were collaborating, transactions may be hidden in the documentation. In one document, it just said “same as James Well. *” Leading me to one more name to my murder case. As many funeral home archives are being digitized, I began my search for a copy of a veteran’s WWII DD214 with the local library. The University of Florida Digital Collections of Cunningham’s Funeral Home from Marion County Florida, had all the information needed to prove the veteran’s military service. African American funeral homes became more prevalent between 1880 and 1920. Many learned their trade after the Civil War up to the Yellow Fever Epidemic. Prior to that, the deceased were handled by white morticians, if allowed. However, keeping with the social times, it was usually the case that the white bodies were kept upstairs, waiting for burial, while the blacks were held in the basement. These notes can also be found in archival records of funeral home. To learn more on history of African American funeral homes, morticians and embalmers, visit the National Funeral Directors and Morticians Association. Back to my murder, it is likely that not only was the couple murdered in 1921, so were four other acquaintances in the following six months. * Name changed to protect the client. 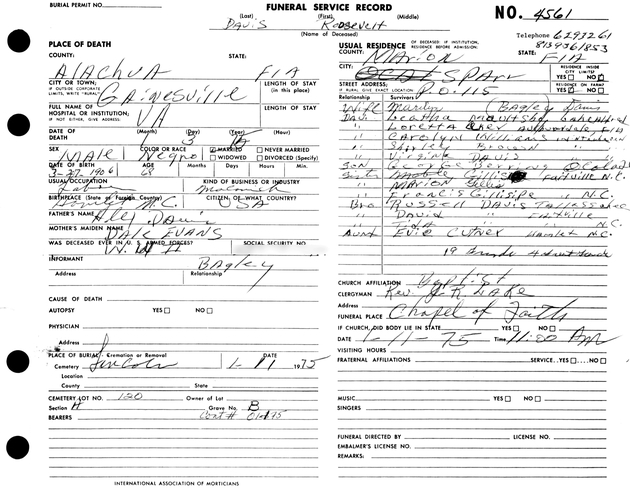 Very interesting to read that secrets could be found within funeral home records. This would not happen today and it show how far we have come as a society. This is so extremely helpful Kathleen. Thanks so much! Thanks for posting. This is unusual and "conspicuous." First of all the records should have been stored for a minimum of 3 years if not 7 for tax purposes. So, I would check with both the Attorney General and Business Bureau to see if any "curious" complaints were made. If an African American funeral home, I would check with National Funeral Directors and Morticians Association to see if they have more information on that funeral director. There are several for Associations for non-AA, but I'm not as familiar. Also check with the local coroner's office for information on your ancestor. Hope that helps. Great Post! I've been on the hunt trying to find funeral home records myself and am having no luck of yet. One, which is white, and took care of several of my GA relatives has gone out of business and won't dilvulge any information to anyone. I understand the records are just sitting in a garage somewhere. Some of the others, I fear have also gone out of business as I can find no current day trace of them but I will definitely continue to try to determine ways to find and use this documentation. Thanks Sanjay, Dionne, Renate and Mavis for stopping by and commenting. Love the notes! I've heard that funeral homes are good resources, but I'm not sure how to go about contacting them. I called one once because they kept the records for a local cemetery. The employee made it quite obvious that I was wasting time he's rather spend otherwise. After that I've been hesitant to contact any funeral homes. Any tips? Valerie, Thanks for stopping by and leaving your note. Know that it could just be a bad day! But, here are a few proven tips for obstinate or hesitant funeral home staff: 1) ask if their books have been microfilmed - State Archives, FHL 2) check the local library and historical society for any transcriptions, extracts or indexes. These local orgs may also know if there is a track record for this behavior (Believe me, other researchers are looking for historical data too.) 3)send your information in writing with a SAE; then make a follow up call about 5-7 days later 4)offer to pay for copy time 5)hire a local to go as a liaison and maybe make copies for you. If this is the route you go, I usually start with the local genealogy society. Thanks for asking and don't give up on one sour experience. I will write a blog on this.